Give me a shout on social media! Visit the Contact & Booking page for a list of locations and hours. The Spine - a Chiropractor's workshop! Chiropractic is a science, an art, and a philosophy that allows the body to function better by reducing interference on the nervous system. Using "Chiropractic Adjustments" (technique) to eliminate "Subluxations" (restricted vertebral segments) we are able to allow "Innate Intelligence" to help our bodies heal naturally. Innate Intelligence refers to the body's natural ability to heal itself. Our body is constantly replacing old, dead cells with new ones, without any extra help - it does this on its own! For example, when you cut yourself, blood comes out, then clots, then scabs over. You did not need to take medicine or get surgery to correct this! Chiropractic is a natural, conservative form of healthcare that neither introduces harmful chemicals to the body (medicines), nor does it open the body up to infections (surgeries). In fact, having a properly functioning nervous system improves your body's ability to fight illness. 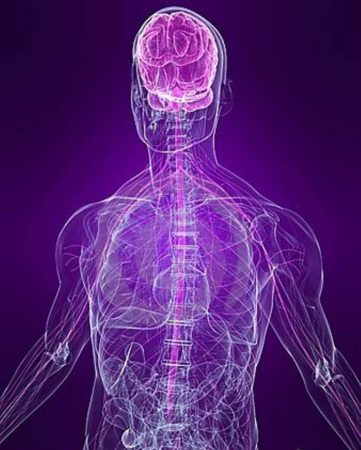 The brain sends signals to your body through the spinal cord. 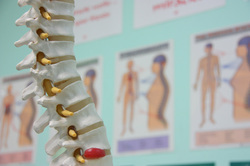 From the spinal cord, pairs of nerve roots exit to form major nerves, which go on to power all of the body's functions. Getting a Chiropractic Adjustment literally "turns the power on!" It's no small wonder the brain is called the "Master Control" of the body. It controls literally everything we do! See that up there? That's your spine. It's also the key to your health. The spine helps keep you upright, and protects the sensitive spinal cord from injury. Our lungs breathe, our hearts beat, and our muscles move our joints because of our nervous system. As life goes on, we expose our bodies to small shocks (think of driving over a pothole, or lifting something incorrectly). This can create a subluxation, which causes a state we like to call "dis-ease" - where our nervous system is unable to function optimally. See below. Which would you rather be? The open pin, or the closed pin? If you have a subluxation, how do you get to wellness? The chiropractic adjustment is designed to eliminate subluxations from the body. It can create wellness, reduce pain, and optimize the environment for your nervous system! Copyright www.drprathap.com. All rights reserved.